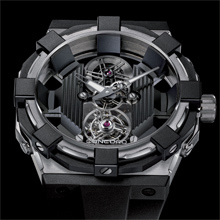 An eight-legged anthropod equipped with a tourbillon movement. A creature that imposes its own vision of mechanics and design. C1 BlackSpider is a predator on the prowl. Its prey is time. Its weapon is empty space. Its technique is surprise. Born in vitro in the C lab, creator of avant-garde watchmaking, the C1 BlackSpider spins a world in which time is caught fast in its web and beats to the rhythmical oscillations of a tourbillon mechanism. Its original concept is a closely interwoven combination of aesthetic and technical elements. The case and movement form an inseparable whole, one being the natural and almost organic extension of the other. This symbiotic relationship engenders an absolute timepiece, the epitome of total design, in which performances go well  beyond mere mechanics. 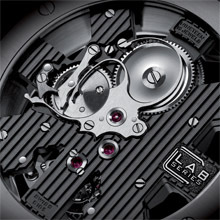 Boldly proclaiming its difference, the C1 BlackSpider is a 25-piece limited edition, and its caseband carries a raised disk bearing the individual series number enhanced by a diamond-polished finish, thereby setting the seal on a symbolically charged watch that is unique in its kind. The 47 mm-diameter case crafted in titanium provides the passing hours with generous scope for expression. Its 13.55 mm depth transforms empty space into a formidable weapon. 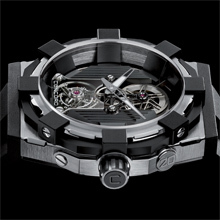 The movement plate serving as a dial is placed at the very bottom of this area, and its eight “legs” embedded in the case radiate an air of powerful determination strangely reminiscent of arachnid predators. The whole design is permeated by a pervasive sense of weightlessness. The grooved monochrome finishing on the plate reveals its dark and intimidating side: like a black widow spider suspended in mid-air, the creature allows the hour and minute hands to sweep over its abdomen, while holding the tourbillon firmly in its grasp. The latter is fitted on a sapphire plaque fastened to the mainplate and screenprinted with the Concord logo. The C1 BlackSpider is a worthy representative of the Concord species. Its ultra-light titanium shell surrounded by rubber tabs merges technology and design while remaining faithful to the brand’s fundamental construction principles: reliable sturdiness, a laterally-screwed protective ring, a sapphire crystal with anti-reflective treatment and encircled by “ramparts”, a fortified crown, and a perfect fit. This unconventional model displays a fascinating and paradoxical blend of density, volume, depth and lightness. The hand-wound 19-jewel C105 movement revealed through the transparent caseback has a three-day power reserve and oscillates at a rate of 21,600 vibrations per hour. The finishing and decoration of the sandblasted and polished bridges set the finishing touch to the design of the watch. The matt vulcanized rubber strap is secured to the case by four self-locking screws, while the iconic lug-free attachment construction ensures a unique flow. The eminently masculine C1 BlackSpider watch boldly asserts its sophisticated temperament and its vigorous design. It treats the sophisticated mechanism of one of the greatest horological complications to a spectacular stage-setting entirely governed by creative instincts.